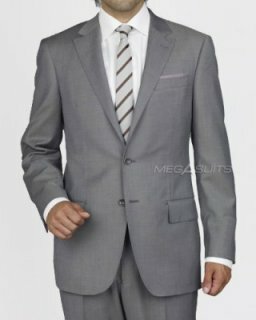 A light grey suit is a popular color in the menswear world. They can add some versatility to your style collection. They should be considered as a good potential addition to your wardrobe. Of the gray shades, I tend to like the darker looks like charcoal a bit more, but I can definitely find occasions to go light. Sometimes the darker looks a little too somber or drab. I think a tightly woven pattern, like glen plaid, looks a little better than a solid. The solids can seem to leave a sheen, in my opinion. If a sharkskin look is what you’re going for though, go for it. A lot of the characters on TV based in Miami tend to like to mix in a light grey suit every once in a while, including Burn Notice. It’s definitely a cool look for tropical areas. Don Draper on Mad Men is also pretty heavy into the light and medium grays. It’s a look I’ve warmed up to over the years. Getting a light gray suit in a lightweight fabric can make it a good option for warmer months. It can look a little less “heavy” on those bright sunny days. A navy blue or dark grey may be too dark for a hot summer day, so it can give you a good third option. It’s also conservative enough to wear to the office or interview if you need it. In most cases, you’ll want to try and mix in a brighter colored tie or at least a bold patterned tie to provide some variety. A gray or black tie may make you look a little drab. Be careful about mixing light gray, white shirt, and light tie. This can make your chest look extremely light and make your face look darker. On a bright sunny day, in photographs, your torso might really look bright with the reflected sun. For the shoes, I find that black can be a little too much of a contrast. A burgundy or a darker brown can often work. It can take a little bit of experimentation to get it right.